Restorative justice is a systemic response to crime that emphasizes repairing the harm caused by the criminal behavior . The new paradigm called "Restorative Justice" has had significant impact, as it meant to be the answer to many victims seeking a prompt impartation of justice , fair and efficient, In addition , the victims to feel heard and participate in the process aimed at healing. 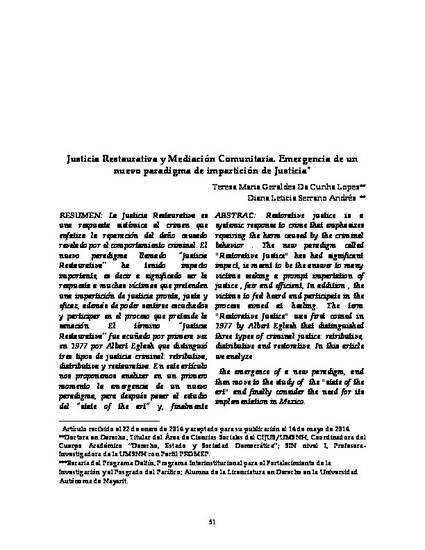 The term "Restorative Justice" was first coined in 1977 by Albert Eglash that distinguished three types of criminal justice: retributive, distributive and restorative. In this article we analyze the emergence of a new paradigm, and then move to the study of the "state of the art" and finally consider the need for its implementation in Mexico.